Deposit your checks wherever, whenever! No more waiting in line! With our Remote Check Deposit feature, you can deposit your checks from the comfort of home or wherever you may be. All you need is a smartphone or tablet and an internet connection. 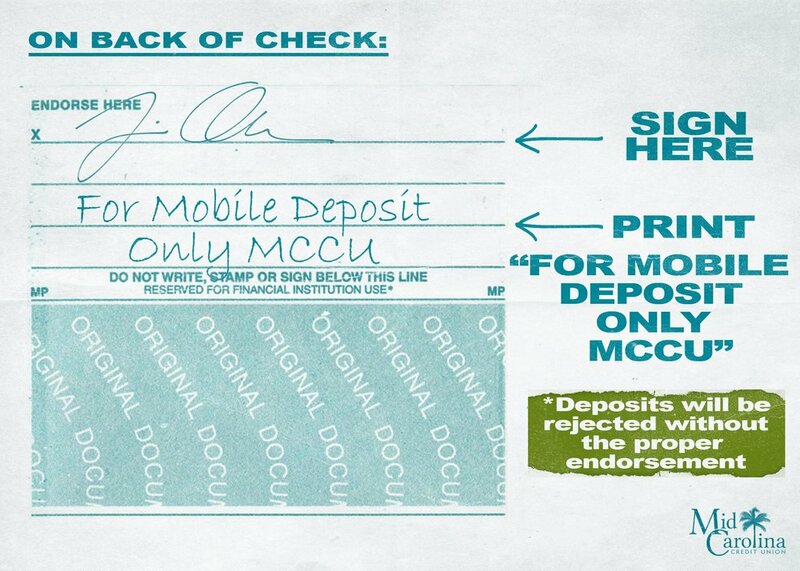 Ensure that your check is properly and legibly endorsed with your signature and label it “For Mobile Deposit Only MCCU”. Endorsements on mobile deposits that DO NOT include the above statement on the back of the check will be rejected. Follow the instructions on the screen to access mobile check deposit and to complete the transaction. When will the funds deposited through Mobile Deposit be available? Credit is not immediate – We batch process every 2 hours from 9-5. All deposits are put on an initial hold of 3 days once approved. Holds may be released upon review of the deposited item. Securely retain each original check until you receive your monthly statement reflecting the deposit. For our terms and user agreement for remote mobile deposit, click here.